My aim in writing this article is to present my observations as a fan as to why or how the current Ginebra roster seems to not live enough to its mantra. 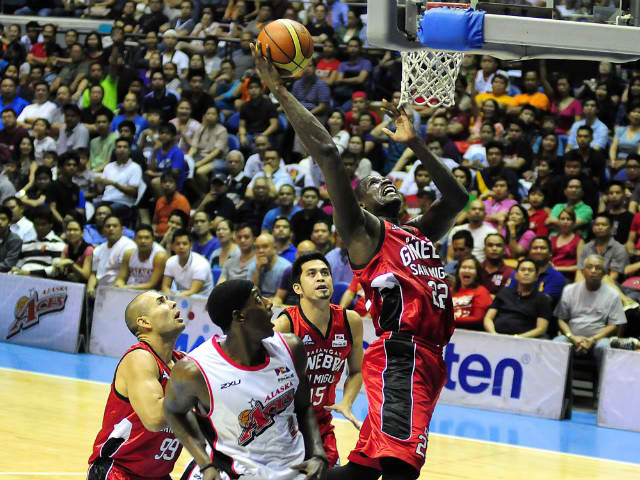 Gabe Freeman, the latest import to attempt to rescue the team from its demise, has said in an article that Ginebra is the best team on paper, and while it is hard for us to swallow that the best out of this current Ginebra squad might remain on paper alone, we have to…at least for now up until we see the team claim the throne once more. I have limited my observations to five sub-headings in order to present them with some order, but make no mistake that I present these observations in hierarchy—that is that I perceive that one is a more pressing issue than the other. In fact, I believe that each observation that I am about to present only intertwines with the others in addressing the seeming disappearance of “never-say-die”. 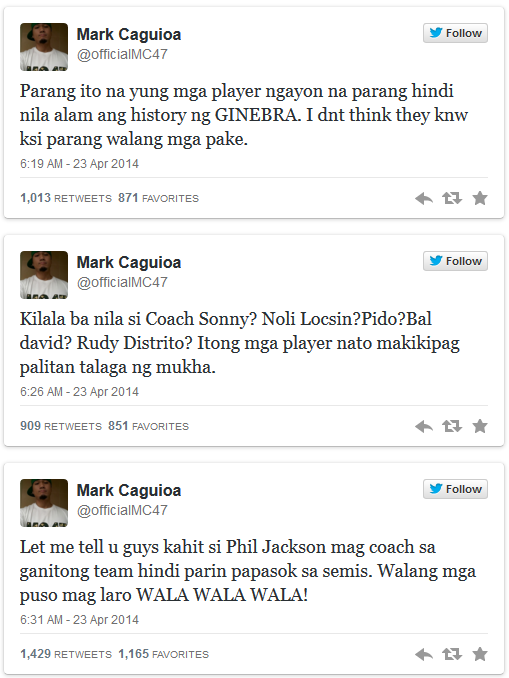 Many blame the coaching staff of Ginebra for the team’s failure to meet expectations. In the eventual loss of Ginebra to San Mig Coffee in Game 7 of the Semis in the Philippine Cup, many bashed head coach Ato Agustin for questionable decisions and poor player rotation. While I thought Agustin did a fairly decent job last conference, and hence disagree with the many who think otherwise, I believe that Ginebra’s problem on coaching is who and what to listen to. In this conference, we were all left confused when assistant coach Juno Sauler was drawing up the plays while Agustin is still listed as the head coach. In the Philippine Cup, many were criticizing team manager’s Alfrancis Chua’s hyper-active involvement in barking out instructions from the sidelines. Who is the real head coach? The players should have one voice to trust and listen to. We see this in Rain or Shine and San Mig Coffee whose respective head coaches have the monopoly of talk during timeouts and halftime breaks. As for Ginebra, I believe that what is happening is that Sauler is trying to compromise sets and plays—his and Agustin’s—perhaps in the common courtesy of preserving the head coach’s system. I thought Ginebra was playing Agustin’s system under Sauler’s instructions. The result? Not-so-good player rotation, confusion in sets, turnovers…you name it. A similar scenario has happened before—when Siot Tangquincen and Jong Uichico were co-coaches of Ginebra. As we all know, the results were not particularly pleasing to both fans and the team alike, even leading to the exit of Uichico from SMC. If Ginebra’s management want to make Sauler head coach, then all they have to do is declare it so that the team can play Sauler’s system. After all, never-say-die is about team cohesion and familiarity with the things the team wants to do inside the court. And all that can only happen if the players and the coach meet at a certain point and are looking at the same direction. The easiest factor to blame for Ginebra’s underachieving was their import scenario. Leon Rodgers was over-hyped while Josh Powell had some more important things to attend to. Gabe Freeman would have made an excellent import had Ginebra given him an early call. In the end, the team was trapped in an unending chain of adjustments. When Rodgers was import, ball rotation was a problem because the dude was a ball-hogger and was shooting 10 three-point shots a game while barely making any. When he was replaced by Powell, rotation was better and more locals got involved, yet Powell has to leave Ginebra after his second game (which he barely played because of injury) to seek greener pastures in the NBA. Freeman arrived to play Ginebra’s last game of the eliminations in the hope that he can lead Ginebra to a win so that at the team can place sixth and will not have to play against twice-to-beat. He was scorching hot in the first half in that game against Rain or Shine, but barely contributed any in the second half and overtime. In the end, Ginebra has to be contented in making the playoffs and facing topseed Talk ‘n Text who has twice-to-beat advantage. Freeman was ineffective, only scoring 15 on terrible shooting against TnT import’s 41. Call it bad luck or poor initial choice, never-say-die nevertheless cannot take place when imports do not sync with locals. Vernon Macklin last season has proven how important this is, and even though Ginebra lost against Alaska in the finals during that time, it was okay because we saw Macklin fighting it all even with a hurting thigh. Should Freeman be allowed to play next conference, we can only hope for better results. Could he have turned Ginebra’s fortune around? The performance of Japeth Aguilar in the eliminations of the Philippine Cup left mouths open in amazement: he slingshot himself to being one of the best players in the league as he led Ginebra to topseed with an 11-3 card with about 20 points and close to 10 rebounds per game. But Ginebra’s semifinals against San Mig Coffee marked the end of Mico Halili’s and Magoo Marjon’s “Japeth-like-it’s-hot”. Since then, Aguilar has not recovered. This conference, the six-foot-nine Gilas forward was only averaging 8.33 points and 6.44 rebounds per game in the eliminations (PBA-Online). Last night, he only scored seven. Clearly, Aguilar has lost his confidence. The once contender for the MVP title is now questionable even to make it to the Mythical Five. Whatever Aguilar and Ginebra are doing to bring that confidence back, we hope that it will come into fruition in the coming Governor’s Cup. Because unless a player believes in himself, he cannot possibly understand or embrace never-say-die. Can Japeth regain his confidence back? Where is the MIGHT in HEIGHT? While Caguioa’s comment do not refer to anyone in particular, it is hard to not associate at least the “lalambot” part of his Tweet to the Twin Towers. Slaughter was highly ineffective in defending Talk ‘n Text’s Richard Howell, so ineffective that seldom-used Billy Mamaril was able to take over with some success. Aguilar, on the other hand, only shot 3-of-8 from the field marked by too many jump shots. Further, we see Aguilar and Slaughter being out-rebounded in countless occasions dating back to the San Mig Coffee series in the Philippine Cup. To be fair, however, we can say that despite Slaughter’s height, the big guy is still only a rookie. His averages this conference are not so bad either—12.0 points, 7.9 rebounds, and 1.2 blocks per game (PBA-Online). Aguilar, on the other hand, is yet to recover from his meltdown during the San Mig series. Nevertheless, as Sonny Jaworski, the epitome of never-say-die, once said: “Kung ayaw mo masaktan, magchess ka na lang!” Ginebra cannot afford to have its big men not assert themselves in the post. Slaughter may need more time to toughen up, but Aguilar should wake up now. Whatever happened to never-say-die? Only the players and coaches can prove that it has not gone yet. #TiwalaLangGinebra: Go for the kill tonight!